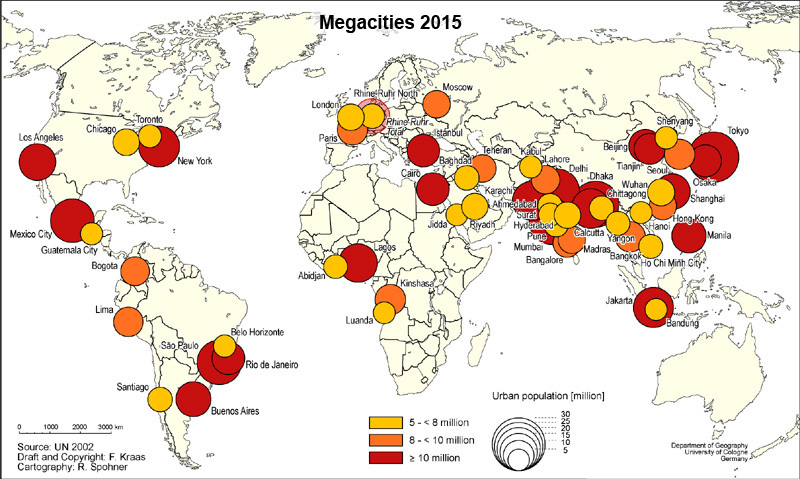 Megacities - according to various definitions cities with more than 5, 8 or 10 million inhabitants - are particularly important in the global urbanization processes. They are results of globalisation and are subject to global ecological, socio-economic and political change. Reciprocally, they are also determining factors of global change due to their global outreach and high developmental dynamics. New are not only the unprecedented dimensions of their quantitative growth, the high concentration of population, infrastructure, economic power, capital and decision-making as well as the extreme, sometimes self-reinforcing acceleration of all development processes. Of particular interest are the simultaneity and overlapping of a wide range of processes with mutual feedbacks, forming extremely complex and dynamic systems. Megacities are a fundamentally new form of urban socialization of the 20. and 21. Century and therefore do represent more than just a quantitative extension of existing urban forms. Informality. Megacities are increasingly subject to an unprecedented loss of governability, with the consequence that a growing number of processes are taking place unregulated, informally or illegally, and their forms, functions and interactions are little researched. In megacities of developing countries a particularly high increase of informal structures can be observed. Informal networks, actors and institutions interfere with and also dominate formal public and private institutions. Informality must be understood as a basic principle of urban live, economy and policy. Megacities thus become important "laboratories of the future", where global trends are reflected and anticipated - they are focal points of global change processes. Megaurban societies are constantly being challenged by complex problems, leading to the emergence of new and complex social, economic and political organization forms.